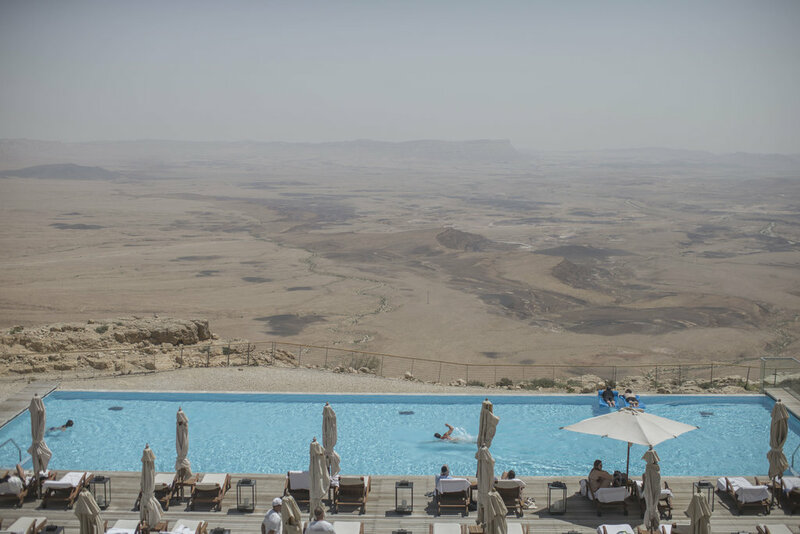 The article also serves as the perfect travel promotion with its accompanying photo of the Beresheet Hotel’s glistening sky blue pool overlooking sprawling Makhtesh Crater! A visit to Israel will most likely include stops in the Golan Heights (its mountainous northern region); Jerusalem (its religious and historical heart), and Tel Aviv (its entertainment and cultural hub). But, for something entirely different, you might want to include a stay in the desert. The Makhtesh Crater is one of Israel’s often over-looked natural attractions. Located in Mitzpe Ramon, (a two-hour drive south of Tel Aviv, and a one-hour 45 minute trip north from Eilat), this 25-mile long, five-mile wide crater, is the world’s largest erosion cirque (valley) and features fossil, rock, and volcanic formations that date back 220 million years. With a depth of 1,650 feet, it was formed not from the impact of a meteorite, but from water and climatic forces. Stop at the newly opened Mitzpe Ramon Visitor Center for interactive exhibits and a quick geology lesson. (There is also a touching memorial to Ilan Ramon, the Israeli astronaut who lost his life in 2003 when the Shuttle Columbia disintegrated upon re-entering the earth’s atmosphere). 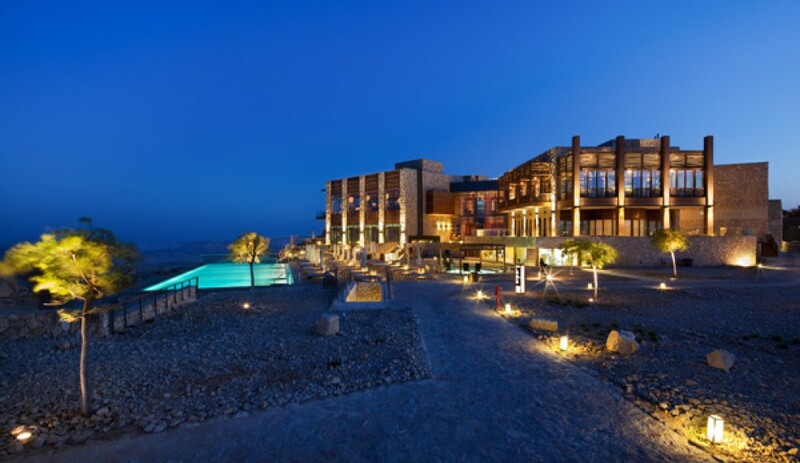 Perched on the edge of the towering cliffs that slope down into Makhtesh Ramon, is the Beresheet Hotel. 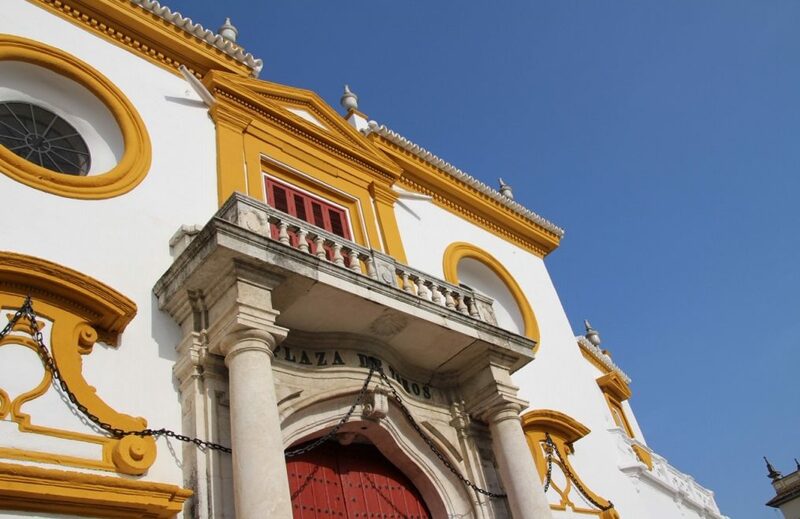 It provides guests with an exceptional view into this dramatic landscape and ancient dwelling place, with enough amenities – spa, indoor and outdoor pools, tennis courts, movie theatre and children’s club—to make this trip a complete pampered adventure. Rough it during the day with guided Jeep tours of the crater and its environs to learn about the geological history of the crater, the Negev Desert’s diverse wildlife and the ancient civilization that called it home. Plenty of other diverse activities in the area will keep you busy: cycling tours, hot air balloon flights, nighttime safaris, desert photography classes, alpaca farms, and wine tasting. 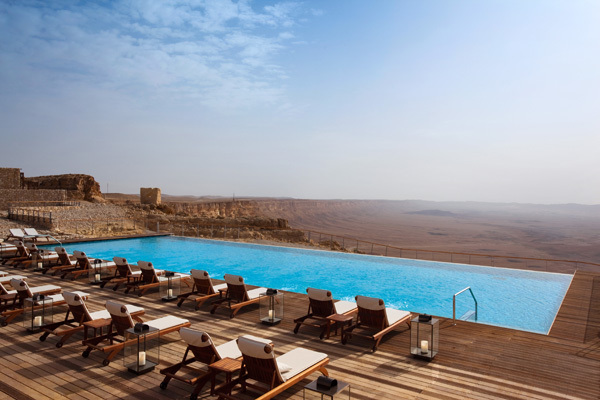 At the end of the day, cool off in the hotel’s pool, perfectly perched on the cliffs above the heart-shaped Makhtesh Crater and take in the wondrous sights of this geological gem. To become a SUBSCRIBER, enter your email address (top, right hand side of the blog or scroll to the bottom if using a cell phone) and then respond to the follow-up email. On your way home from Israel, why not make a stop in Istanbul — it’s only a two-hour flight from Tel Aviv. Click here to read my recent article: Istanbul: Where East Meets West. 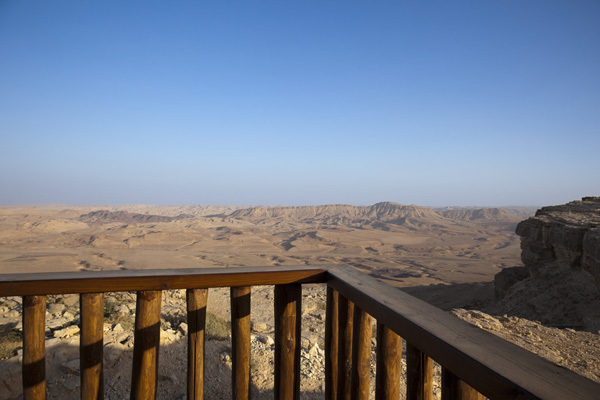 This entry was posted in Israel, Mitzpe Ramon, Negev Desert and tagged Beresheet Hotel, Israel, Israel desert, Makhtesh Crater, Mitzpe Ramon, Negev Desert. Bookmark the permalink.